Ketones in the urine can be detected using similar types of dipstick tests (Acetest or Ketostix). Ketoacidosis can be a life-threatening situation in Type I diabetics, so having a quick and simple test to detect ketones can assist in establishing a diagnosis sooner. Transplantation of a healthy pancreas into a diabetic patient is a successful treatment, however, this transplant is usually done only if a kidney transplant is performed at the same time. Although a pancreas transplant is possible, it is not clear if the potential benefits outweigh the risks of the surgery and drug therapy needed. Cataract — A condition where the lens of the eye becomes cloudy. Diabetic peripheral neuropathy — A condition where the sensitivity of nerves to pain, temperature, and pressure is dulled, particularly in the legs and feet. Diabetic retinopathy — A condition where the tiny blood vessels to the retina, the tissues that sense light at the back of the eye, are damaged, leading to blurred vision, sudden blindness, or black spots, lines, or flashing lights in the field of vision. Glaucoma — A condition where pressure within the eye causes damage to the optic nerve, which sends visual images to the brain. Hyperglycemia — A condition where there is too much glucose or sugar in the blood. Hypoglycemia — A condition where there is too little glucose or sugar in the blood. Insulin — A hormone or chemical produced by the pancreas, insulin is needed by cells of the body in order to use glucose (sugar), the body's main source of energy. Ketoacidosis — A condition due to starvation or uncontrolled Type I diabetes. Ketones are acid compounds that form in the blood when the body breaks down fats and proteins. Symptoms include abdominal pain, vomiting, rapid breathing, extreme tiredness, and drowsiness. Kidney dialysis — A process where blood is filtered through a dialysis machine to remove waste products that would normally be removed by the kidneys. The filtered blood is then circulated back into the patient. This process also is called renal dialysis. Pancreas — A gland located behind the stomach that produces insulin. Crutchfield, Diane B. "Oral Antidiabetic Agents: Back to the Basics." Geriatric Times, May 1, 2003: 20. "Gestational Diabetes Increases 35% in 10 Years." Health & Medicine Week, March 22, 2004: 220. Kordella, Terri. "New Combo Pills." Diabetes Forecast, March 2003: 42. "New Drugs." Drug Topics, November 18, 2002: 73. "Research: Lower Chromium Levels Linked to Increased Risk of Disease." Diabetes Week, March 29, 2004: 21. "Standards of Medical Care for Patients with Diabetes Mellitus: American Diabetes Association." Clinical Diabetes, Winter 2003: 27. "Wider Metformin Use Recommended." Chemist & Druggist, January 11, 2003: 24. American Dietetic Association. 216 W. Jackson Blvd., Chicago, IL 60606-6995. (312) 899-0040. http://www.eatright.org. Juvenile Diabetes Foundation. 120 Wall St., 19th Floor, New York, NY 10005. (800) 533-2873. http://www.jdf.org. National Diabetes Information Clearinghouse. 1 Information Way, Bethesda, MD 20892-3560. (800) 860-8747. Ndic@info.niddk.nih.gov. http://www.niddk.nih.gov/health/diabetes/ndic.htm. "Insulin-Dependent Diabetes." National Institute of Diabetes and Digestive and Kidney Diseases. National Institutes of Health, NIH Publication No.94-2098. "Noninsulin-Dependent Diabetes." National Institute of Diabetesand Digestive and Kidney Diseases. National Institutes of Health, NIH Publication No.92-241. a general term referring to any of various disorders characterized by excessive urination (polyuria); when used alone, the term refers to diabetes mellitus. (See Atlas 4, Part D). maturity-onset diabetes of youth (MODY) an autosomal dominant variety of type 2 diabetes mellitus characterized by onset in late adolescence or early adulthood. The Expert Committee notes that most cases of diabetes fall into two broad categories, which are called Type 1 and Type 2. There are also other specific types, such as gestational diabetes and impaired glucose homeostasis. See table for definitions of types of diabetes mellitus. The metabolism of body protein when sufficient amounts of insulin are not available causes an elevated blood urea nitrogen. This first occurs because the nitrogen component of protein is discarded in the blood when the body metabolizes its own proteins to obtain the glucose it needs. Another manifestation of diabetes mellitus is visual disturbance due to increased osmolarity of the blood and accumulation of fluid in the eyeball, which changes its shape. Once the diabetes is under control, visual problems should abate. Persistent vaginitis and urinary tract infection also may be symptoms of diabetes in females. Other problems related to the destruction of nerve tissue are the result of autonomic nervous system involvement. These include impotence, orthostatic hypotension, delayed gastric emptying, diarrhea or constipation, and asymptomatic retention of urine in the bladder. The carbohydrate counting system focuses on matching the unit of insulin to the total number of grams of carbohydrate in food eaten. This system is the most accurate method for calculating insulin to food intake. Human insulin (Humulin) is produced by recombinant DNA technology. This highly purified biosynthetic insulin reduces the incidence of allergic reactions and the changes in subcutaneous tissues (lipodystrophy) at sites of injection. 3. Pathophysiology of diabetes mellitus, including functions of the pancreas and the long-term effects of uncontrolled diabetes. 4. Insulin administration (if appropriate), including types of insulin and syringes, rotation of sites of injection, injection techniques, and pump therapy instructions. 6. Oral antidiabetic agents, including information about drug-drug interactions, proper administration, and potential side effects. 7. Personal hygiene and activities of daily living, including general skin care, foot care, treatment of minor injuries to avoid infection, a formal exercise program as well as exercise at school or at work, recreational activity, and travel. 8. Identification tag and card and needed medical information. 9. Information on what to do on “sick days” when nausea, vomiting, or respiratory infection can interfere with the usual meals and exercise. Complications of diabetes mellitus. From Damjanov, 2000.
pituitary diabetes insipidus central diabetes insipidus. n a great number of limb amputations are caused by diabetes, especially amputations of the feet; blood infections in the feet can go unnoticed by the patient because of a lack of feeling caused by diabetic neuropathy. n a condition of glycosuria caused by inhibition of phosphorylation of phlorizin. It is not related to an endocrine disturbance. Type II is non-insulin-dependent, similar to the adult onset diabetes in humans due to pancreatic damage—there is a high or normal initial blood insulin level and no increase in insulin levels as a result of the glucose load. It is the form seen most often in cats. diabetes mellitus that is difficult to control, characterized by unexplained oscillation between hypoglycemia and diabetic ketoacidosis. diabetes mellitus in which onset or recognition of impaired glucose tolerance occurs during pregnancy. a syndrome of marked hyperglycemia and hyperosmolarity with central nervous signs, resembling diabetic coma. due to deficient secretion of insulin by the beta cells of the pancreas. See diabetes mellitus type I (above). develops in the young; see diabetes mellitus type I (above). the secretion of insulin is unimpaired but the response of tissue receptors is diminished. See diabetes mellitus type II (above). 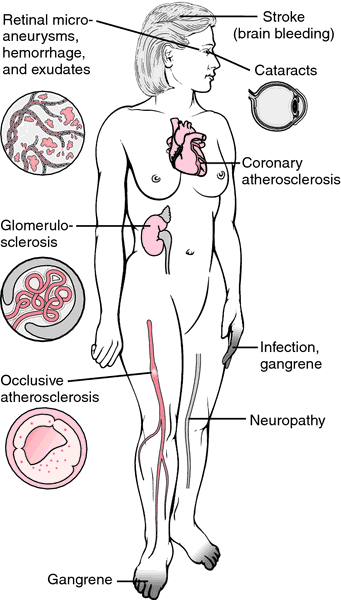 hyperglycemia may occur in association with pancreatitis, hyperadrenocorticism, acromegaly, and treatment with glucocorticoids or progesterone. altered carbohydrate tolerance is induced by glucocorticoids and progestogens. Hyperglycemia and diabetes mellitus can be associated with the administration of such drugs or hyperadrenocorticism. A. Try to reduce her stress. Keep an eye on her, but don't make it sound like such a big deal. Here we can find information on alternative medicines for diabetes. Q. my grandmother was diabetic ... and i learned that diabetic is genetic ... should i be concern for me or or for one of my family reletives ... she suffered a lot and she died of it .. if a blood tests shows high amount of sugar in my blood , does i mean i am diabetic ?